These are not my photos, these are courtesy of Market Manila. This site offers good information especially if you are like me who love to cook but is clueless as to where to find some of the ingredients. While lurking around his site I saw these photos which made me salivate! 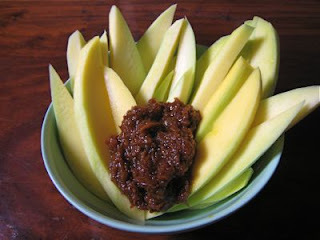 If there is Mariposa and the IT Guy, Michelle and Barrack O, pen and pencil, well, there is green mango and bagoong (shrimp paste). Have I told you before that I'm a sucker for anything sour and salty? Well I am! Always has been. Too see other's choice, please visit the official host of Food Trip Friday! Thank for joining this week. I just had that last night... yummy! the photos make my mouth water! arggghhh! favorite ko ang green mango salad--with onions, kamatis at bagoong. hayy, sarap! Oh my! !Naglaway naman anko sa mga mangga at bagoong posts nyo! !Soo envious naman! !Kelan kaya ako uli makakain ng manggang hilaw?? nice info, Mariposa! I never knew that. 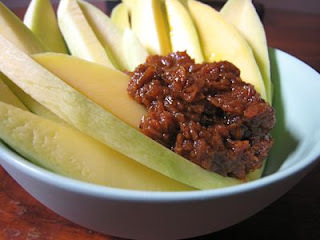 At my end we have green mangoes with vinegar, soy sauce, sili, and some would love to have a bit of sugar in it. My my you will have your nose dripping as you ate the mangoes. btw, this is the second green mango entry i met today.